This has been a special week at Stony Brook University. Leading up to Veteran’s Day this coming Monday, November 12th, University Libraries took the opportunity to offer programming to honor our Veteran students, faculty & staff. On Monday Nov 5, we held a film screening of “The Great War” to mark the 100th Anniversary of the end of WW I. The following day was Literary Karaoke in honor of Veterans. 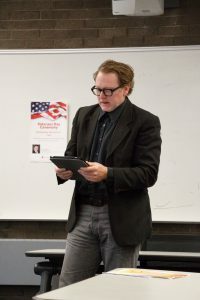 Attendees heard some poetry as well as excerpts from fiction and non-fiction works related to military studies. This event was intended to highlight a new collection available through University Libraries and funded by a Presidential Mini-Grant for Departmental Diversity. On Wednesday several SBU Librarians attended the campus Veterans Day Ceremony. The University Libraries were represented on the planning committee for this years’ ceremony and the Special Collections and University Archives provided display items from the exhibit “World War I Through the Lens: Photographs of the Western Front, 1914-1918”.